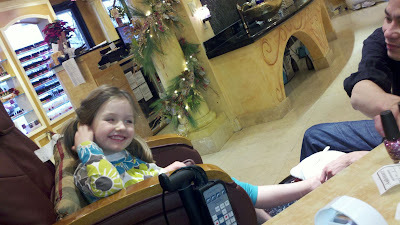 Yesterday on a whim, Josie and I decided to get pedicures after doing some holiday errands. It was her first "real" pedicure, although we have fun with our Piggy Paint at home often. Those of you who know Josie personally won't be surprised that she just sat and chatted away with the pedi guy the whole time. She told him all about school, her cousins, her best friends and her plans for Christmas. I was cracking up, because she jumped right into it - kicked back in the massage chair and chatted away. This extra (slower) time together makes me realize how much I miss her now that she's in school & I am working full-time. 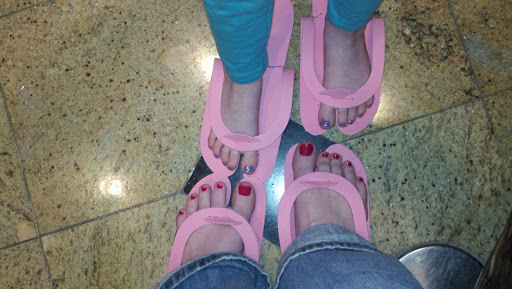 Three cheers for mama/daughter time (and for purple glittery toes with a confetti topcoat)!